ThrifTee Gear is an awesome concept. If you've never encountered them before, they make upcycled lunchbags from your very own t-shirt! They make some from tees they find as well but to me, nothing beats making an eco-friendly lunchbag out of your own beloved tee. ThrifTee Gear now makes two different lunchbag options so you can choose! The new addition is a backpack style which is a great lunchbag for older kids! Now, I think it's high time for a giveaway don't you? 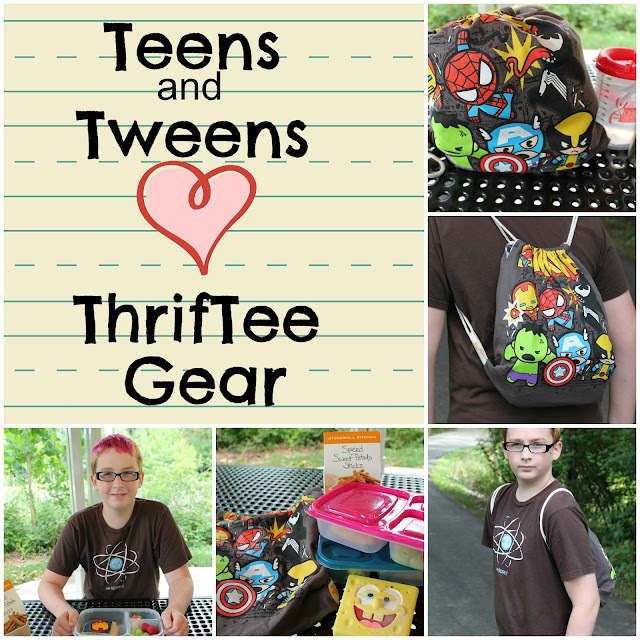 The amazing Tracie of ThrifTee Gear is giving away a Custom ThrifTee Gear Eco-Cool Lunchbag, retail value up to $29.95. I love these, and have wanted one for so long! Such a cute idea! I think I'd have to keep this lunch bag for myself! I don't do facebook. But, I do think this is a cool idea. Some of us grown ups have a t-shirt that we're not ready to retire just yet. Doctor Who: First Day of 7th Grade!